EXPLORER 700 provides access to the highest bandwidth available via BGAN, thereby facilitating a platform for a wide range of applications with need of high performance. Disregarding the environmental conditions, it is designed to last and with the detachable antenna, it is ideally suited for temporary camps or semifixed installations. 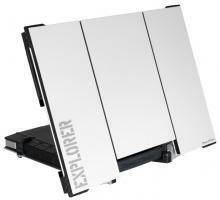 The flagship in the EXPLORER Series provides multiple interfaces to support a wide range of applications. Ideal for video streaming applications and large file transfer and can be used by smaller workgroups sharing a temporary or semi permanent office environment. The fastest BGAN terminal on the market with download and upload at 492 kbps. Moreover, it supports Inmarsat’s BGAN X-Stream, on-demand streaming at +384 kbps for applications demanding outstanding performance. Designed to withstand severe environmental conditions such as humidity, dust, extreme weather and changing temperatures.